This sky map shows the positions of the moon and Venus before sunrise at 6 a.m. EST on Saturday, Jan. 29, 2011 as seen from the U.S. East Coast. 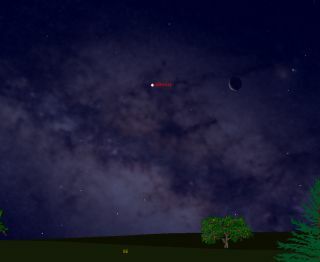 February 2011 is the last full month to spot Venus in a completely dark sky until December 2011. If you're up a couple of hours before sunrise on Saturday (Jan. 29), look to the southeast and you'll see Venus glowing about 8 degrees to the left (east) of a lovely waning crescent moon. Since your fist held at arm's length covers about 10 degrees of the sky, Venus and the moon will appear closer than your thumb and pinky finger. By Sunday morning (Jan. 30), the moon will have shifted its position, appearing slightly closer – about 7 degrees – below and to the left of Venus. Venus shines brilliantly in the dawn, though not quite as brightly as it has during the last couple of months, and in February it will sink about 5 degrees closer to the horizon. So during February, Venus will drop about half a fist lower to the horizon. Currently, Venus is rising about three hours before the sun, but it will shift closer to two hours by the end of February. February, in fact, will be the last full month to observe Venus in a totally dark sky until next December. Venus has also entered its "uninteresting season" for telescopic observers. For the rest of this year it will appear through telescopes like a very small, featureless, gibbous moon. Venus is never really disappointing, though. Although it's a bit dimmer than it has been in recent weeks, it’s still immensely brighter than any other point of light. Venus is always brighter than anything in the sky apart from the sun and the moon. And what's more, you can have fun during February as Venus passes across the "Teapot" of Sagittarius in the southeast sky. Watch as this familiar star pattern glides below Venus in the starry background, moving toward the upper right as February progresses. As a consequence, Venus will have some very close conjunctions with a few 3rd-and 4th-magnitude stars in Sagittarius on the mornings of Feb. 7, 16, 18 and 25. In all of these cases, the distance separating Venus from these moderately dim stars will be less than 0.2 degree (less than the apparent width of the moon), so you might not be able to see them with your unaided eye. But if you check these out with binoculars, you’ll see these stars shining close to the lantern-like Venus.